The Bastille Upholstered Cafe Bar Stool, inspired by Xavier Pauchard, celebrates the truly adaptable nature of his famous Marais A (aka Tolix designs). Originally designed and produced nearly a century ago in France, the Marais A / Tolix designs became a wildly-popular choice in cafes, restaurants, and homes all over the world, and has enjoyed a rise in popularity in recent years due to its solid construction and distinctively industrial styling. The Marais / Tolix designs have been interpreted in many ways through experimentation in materials, color and texture. 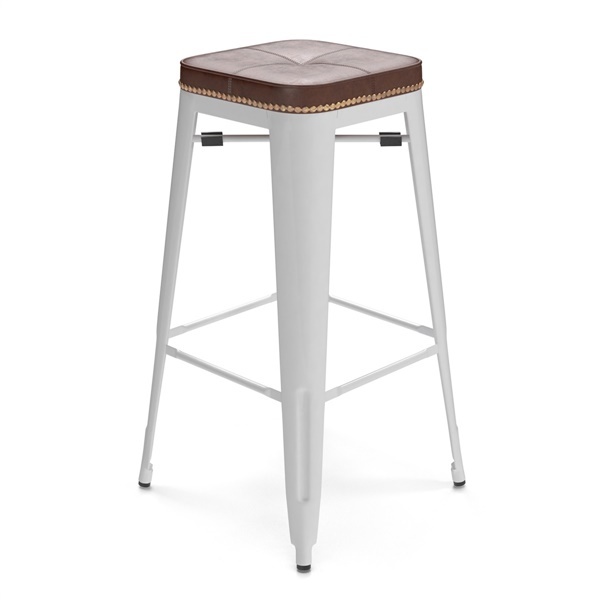 The Bastille Upholstered Cafe Bar Stool accurately replicates the original form and construction and adds a cushioned seat, upholstered in a vintage-styled leatherette accented by a row of distressed brass-colored studs. An admirer of that Bastille style and I was excited to find stools in the likeness without being an exact replica, the studded trim around the seat was the coolest feature of the design - i'm happy to have them! Saw these in a small cafe in my home town and I had to have them! They said they ordered from here and I am blown away especially by the prices but also the unique items - new favorite furniture site!! 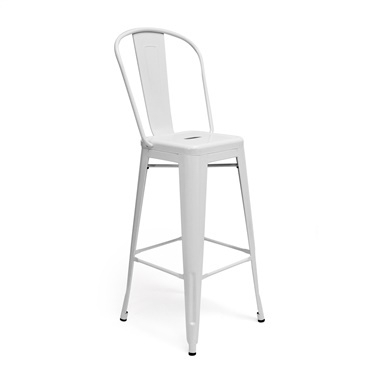 The white coating on the legs give these stools a more retro contemporary style that went exceptionally well with the look and feel of my kitchen, a total win! Thank you! Stunning stools! Absolutely perfect in my kitchen, so excited to finally have the design done! The vision for our venue was to have a modern western / rustic theme, it was difficult to find the right stools but these pretty much nailed what we were going for - they look great and are fine quality - impressed by the affordability as well - thank you inmod! Glad I went for the upholstered version of this stool! Ultra comfortable!